Phoenix Antique Rugs and Carpets - From Paradise Valley to the affluent suburbs of North Tempe, it's our pleasure to serve designers, homeowners and carpet collectors throughout the Valley of the Sun. For more than 30 years, Nazmiyal has been serving the greater Phoenix area and providing antique carpets and textiles that decorate the area's most prestigious homes. Our impeccable service, fair prices and exceptional inventory of vintage rugs and antique carpets makes us the go-to source for textile art and design pieces from all corners of the world. Plus, free shipping is available to all customers, and each purchase is covered by a comprehensive satisfaction guarantee. Discover why Nazmiyal is the most trusted source for carpets in Phoenix and Arizona. Phoenix is a diverse metropolitan area with a thriving economy and ample cultural attractions. Mediterranean villas, historic estates, Mission-style homes and Southwestern subdivisions dot the rapidly expanding suburbs of North Tempe, North Central Phoenix and Maricopa County. Whether you are searching for a Navajo chief's blanket, an angular flat-weave kilim or a palace-sized Persian carpet, we have a piece that will complement your decor and personal style. Our buyers are constantly searching for vintage mid-century carpets, designer floor coverings and antique Oriental rugs that meet our standards. Our ever-changing inventory includes hundreds of carpets, textiles and kilims from countless geographic regions around the world. If you're looking for something specific or are delving into our collection for the first time, our professional antique carpet experts are here to help answer questions and guide you toward the perfect piece or pieces. Once you find an item that fits your size, color, style and budget requirements, we'll arrange to have that carpet shipped directly to your Phoenix-area home. 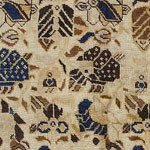 All carpets in our inventory our eligible for free shipping to anywhere in Arizona and the continental USA. This offer applies to small items, oversized carpets and large area rugs. Free shipping is just one way that we offer customers the best value and make shopping for rugs online a better experience. Customer satisfaction is our number-one priority. So you can shop with confidence, we offer a 100 percent satisfaction guarantee on every rug purchase. We provide educational resources, high-definition photos and extended descriptions for each item in our catalog. Even so, images of a luxurious tactile item aren't always enough for buyers to get a sense of the texture, scale, size and level of detail. To give each customer all the benefits of a local shopper, we encourage customers to place the rug in their home and live with the item for 72 hours before making a final decision. If you decide that the carpet isn't right for any reason, you may return the item within three days and only pay return shipping. Our competitive prices also set us apart from the competition. We guarantee the lowest market prices on items of an equivalent age and condition. Whether you're looking for a tribal kilim, a flat-weave Scandinavian rug or antique Persian carpet for your Phoenix home, we invite you to browse through our comprehensive online gallery. Click here to search our entire collection of antique rugs and vintage carpets!